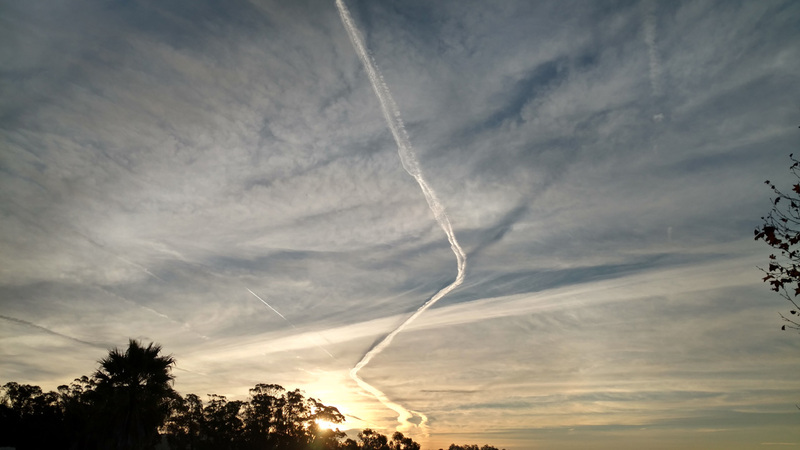 Ever think about how artificial clouds from aircraft affect the weather? Notice that there aren’t any natural clouds in these photos. Without aircraft, the sky would have been perfectly blue today. This photo was 30 minutes later. Air traffic is heavy in the mornings. These are commercial aircraft manufacturing water in the sky by way of burning hydrocarbon-based fuel. They produce a gallon of water in the lower stratosphere for every gallon of fuel they burn. So, back to why there’s a season for contrail clouds. Artificial clouds are formed by the “ice wakes” of aircraft that persist when conditions are right. At that altitude–25,000 to 35,000 feet, depending on where on Earth you are–it’s deeply cold, so the water vapor produced by the jet engine is instantly frozen and begins expanding in the low pressure environment. When there is high humidity, that moisture is also frozen, of course, and is usually referred to as “ice crystal saturation.” When enough ice crystals are present, the moisture from the jet engine has condensation nuclei to bond with. In the wintertime in the western US, when we have any chance of rain, we also purposely fill the sky with artificial condensation nuclei. This is called weather modification, and ongoing programs exist in most western states in America to enhance precipitation. Clouds are made of moisture and condensation nuclei, and the more we spray cloud condensation nuclei into storms, the more rain and snow we can get from a storm. 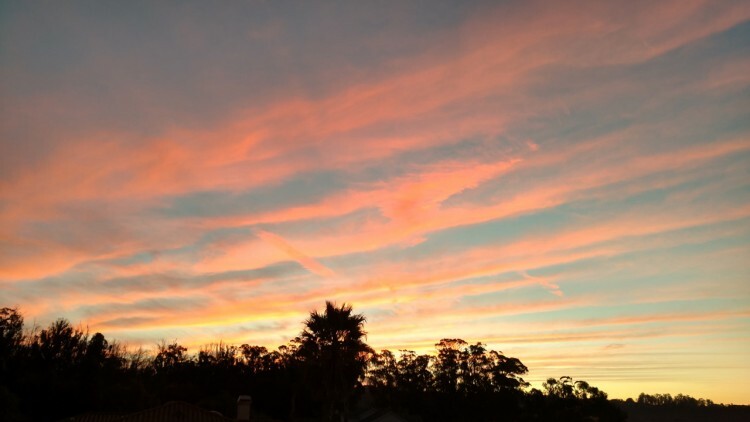 Because the chemical materials used (regularly for over half a century in some areas) also bond with the frozen water vapor from aircraft, contrail-spawned clouds are more persistent than ever, and account for a significant part of our global cloud cover…. and as we can see from this morning’s photos, they cause immediate changes to the weather in the daytime. At night, they insulate the earth and prevent heat from escaping, making it warmer at night, especially when combined with tropospheric clouds to form a double layer of insular cloud cover.